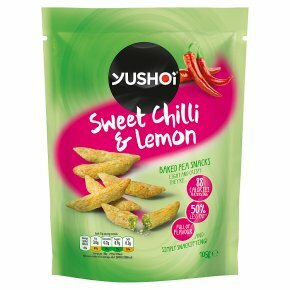 Baked Pea and Rice Snacks Seasoned with Sweet Chilli and Lemon. Light and crispy. 88 calories per serving. Full of flavour. Simply snackifying! 72% green pea. Source of protein. High in fibre. Gluten free. No artificial colours, flavours or MSG. Suitable for vegans. Vegetarian Society Approved.50% less fat* *This product contains 50% less fat than standard ready salted crisps.